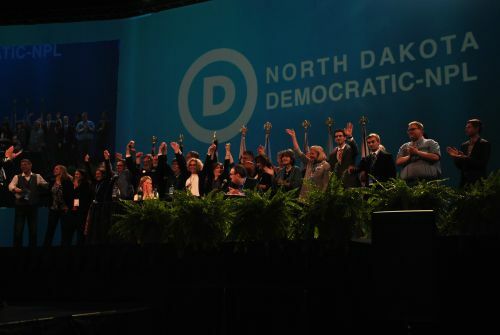 GRAND FORKS - Enthused for change, hundreds of delegates, 650 to be precise, kicked off the 2018 North Dakota Democratic-NPL Convention Friday morning at the Alerus Center. A year and a half after President Donald Trump took office, a “political tsunami is sweeping across this state,” Casey Buchmann from Washburn said. He became the first candidate to receive a North Dakota Democratic-NPL endorsement, and he’s planning on running for the Public Service Commission. Jean Brandt, a mother, farmer, and rancher with a background in agriculture is from Kramer ND, and was also nominated to run for the six-year term as Public Service Commissioner. Representative Kathy Hogan offered a credential report, saying that by 2pm, 423 certified delegates and 50 alternate delegates were present in the house. “There is so much good news in this convention, every district in the state is represented now,” Hogan said. 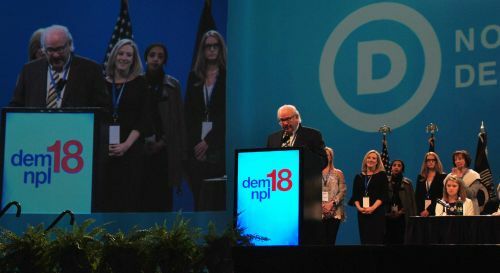 Opening the ceremony, Representative Josh Boschee, who also represents the Dem-NPL at the national level, said the Democratic National Committee has changed and it now represents Democrats from the ground up, and not the other way around. “Out of this darkness, the resistance was born,” said Dina Baird of the Democratic National Committee. The 2016 election results have prompted a resurgence in politics, including, but not limited to the Women’s Marches, to “Saturday Night Live” skits featuring Melissa McCarthy’s interpretation of former White House press secretary Sean Spicer, and to a 10-year record-breaking spike in participating delegates. Senator Heidi Heitkamp said this year's renewed interest stems at least in part from the national political scene. "I think people are really motivated, people want to participate and get involved," Heitkamp said. "A big part of that is driven by the national politics, and I also think they want to hear from Joe Biden, and I would like to think that they want to hear from me, and they want to give me a great kickoff for the beginning of the political season." Another voice of discontent came from attorney David C. Thompson, nominated by the Dem-NPL to run against incumbent Wayne Stenehjem for North Dakota Attorney General, the most powerful legal office in the state. Thompson is a long-term attorney with a Fargo and Grand Forks law firm. He’s running against Stenehjem because he believes that Stenehjem, along with Congressman Kevin Cramer, and former Governor Jack Dalrymple, are guilty of Class C felony bribery stemming in part from a 2011 underhanded deal with Continental Resources oil magnate Harold Hamm. “North Dakota lost revenue because of this,” Thompson said. “Oil and gas money leveraged that, Wayne Stenehjem knew, he was the legal adviser. We accused Governor Dalrymple of a Class C felony, and I do the same today in respecting Wayne Stenehjem. People say, 'What's the difference?' In this state, over the course of the last several years, we have had a level of corruption by oil and gas money that's unprecedented. “If elected, not only will I not tolerate these practices, I will prosecute them,” Thompson said. After his speech, he stepped down after a loud round of applause. He handed over a copy of the report he co-wrote with Erik A. Escarraman, which HPR will be looking into further. “I’ve painted a target on my back, but that’s okay,” Thompson said. Campaigning with a “top-down” strategy is a mistake Democrats made in 2016, Dustin David Peyer said. Peyer is running for Senator Heidi Heitkamp’s U.S. Senate seat, and he’s targeting the 40 percent of voters who did not go to the election booths in 2016, he said. Peyer, like others, is noticing a change sweeping across the prairie: people, at long last, are lining up to volunteer their time to promote change. Peyer is a hardliner, offers a hesitant hand across the partisan aisle. He stands with the author of the Fair Wage Act for North Dakota, Kathrin Volochenko, of Mercer, who plans to raise the minimum wage to $15, and is building his platform to fight corruption, initiate WSI reform for emergency personnel, and repeal the North Dakota Blue Laws. If he receives the nomination from the Democratic-NPL to run for the Senate, he said no matter how dirty his opponents get, he will continue his grassroots campaign, knocking on doors. 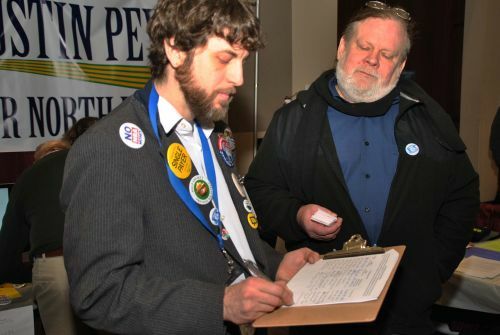 Peyer's political experience isn’t as advanced as Heitkamp’s; he was a Bernie Sanders delegate, so he knows he has a tough race to receive the Dem-NPL endorsement. 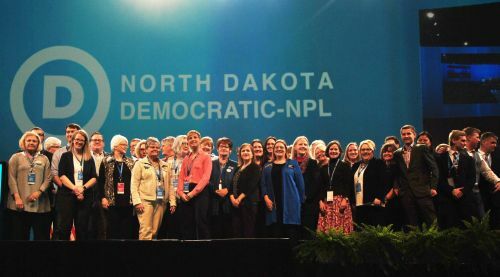 In 2014 and 2012, the Dem-NPL had fewer than 500 delegates, according to Daniel Tick, communications director for the North Dakota Democratic-NPL. In 2016 he reported 522 delegates registered, with 40 alternate delegates. So far this year, 650 delegates and 150 alternative delegates have registered. The funeral for former Governor George A. “Bud” Sinner kept some delegates and aspiring politicians away from the convention’s start-off. Although all candidates’ names are not in, and the Republican convention won’t begin until April 6, this year’s race promises to be interesting, and in some cases, dirty. 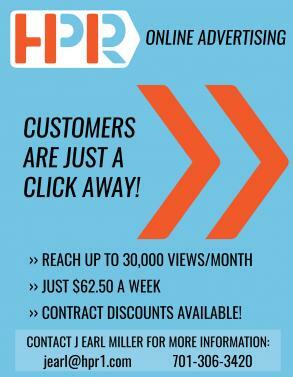 Already, Republican Representative Daniel Johnston tried to slip a punch under the political belt by advertising for bipartisanship: he posted a website,www.heidiheitkamp.com, which links directly to Congressman Kevin Cramer’s official website. 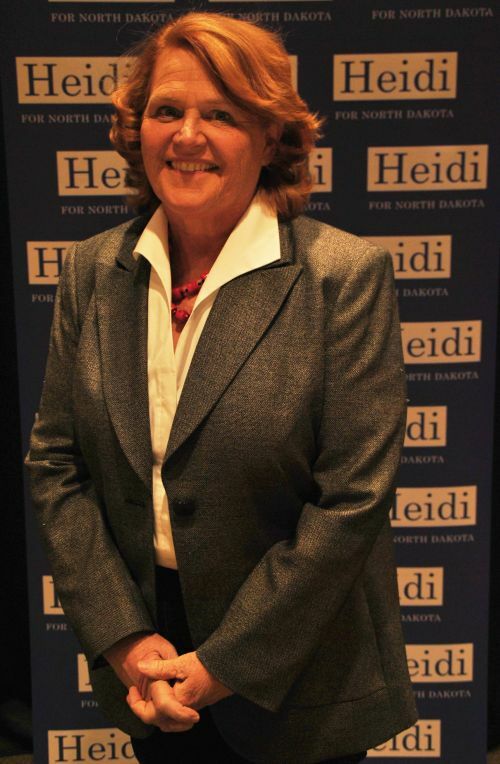 Senator Heidi Heitkamp’s official website, www.heitkamp.senate.gov/public/, was not affected. Some political seats at the national and state levels have multiple Democratic candidates, and so far it remains to be seen if they will continue the race without a Dem-NPL endorsement. Heitkamp is up for reelection this year, most likely against presumptive nominee Cramer for her Senate seat. Firefighter Dustin David Peyer also plans on running for Heitkamp’s seat; and so far, from the Republican side, Senator for District 19 Tom Campbell, a rancher, and Gary Emineth, former chair for North Dakota’s Republican Party, both declared then quickly withdrew from the race. Cramer flip-flopped for weeks debating whether to run for the Senator seat, and it was only after President Trump gave him the political nod that he jumped at the opportunity. It’s too early to tell, but political polls have gone both ways in the Heitkamp/Cramer race. Some polls have put Heitkamp ahead, others show Cramer has a slight lead. Tom Dixon, a trial lawyer and former chair of the Democratic Party, nominated David Thompson, an attorney, for Attorney General of North Dakota, and the motion was passed. 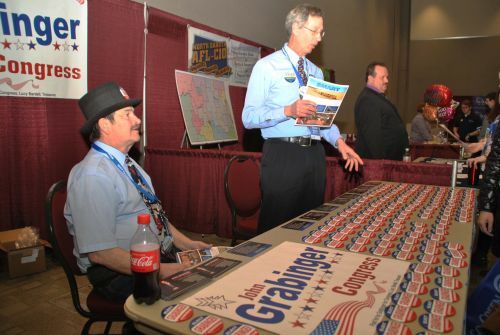 Fargoan Ben Hanson, a former state representative, and Representative John Grabinger, a volunteer firefighter, expressed their interests to run for the state’s only U.S. Congressional seat. 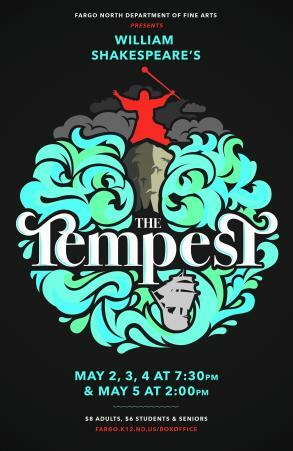 On the Republican side, Tiffany Abentroth, a former United States Marine who has no political experience, Senator Kelly Armstrong, a partner in a Dickinson law firm, and Campbell, a farmer and rancher from Grafton, have expressed interest in running. Representative Boschee will be running for Secretary of State of North Dakota against incumbent Al Jaeger and possibly Will Gardner, the IT director at First Court and former District 34 chairman for the Republican Party. Kylie Oversen, former state representative and current Democratic-NPL chair is planning on running for tax commissioner against incumbent Ryan Rauschenberger. Current Senator Jim Dotzenrod received the Dem-NPL endorsement and plans to run for the position of agricultural commissioner against incumbent Doug Goehring, who has held the post since 2009. Senator Erin Oban of District 35, a Democrat who clings tenaciously to her position in “red” city Bismarck, will most likely be running against Gary Emineth. Emineth recently took down multiple Twitter and Facebook posts containing derogatory and untrue statements about Muslims. Oban is the only elected Democrat in the western part of the state, she said. She believes in working across the aisle, and said all issues can be discussed as long as there’s mutual respect. Issues that are close to her heart and should be nonpartisan include school safety, ensuring students and teachers are provided for. She’s also behind investigating continued relaxation into the links between drug addiction and incarceration, and would support bills that would lighten the financial burden jails and prisons create on taxpayers. “I’m just exhausted by the inability to not be able to discuss important topics in a respectful manner,” Oban said. Laws are black and white, but opinions are shades of gray. Oban never planned to run for office, and didn’t expect to win, but she’s running again and knows she may also face a dirty race. “But there’s a difference between dirty and holding people accountable,” Oban said. Democratic House of Representatives and Senatorial candidates were also named during the convention, but a complete list was not available late Friday. The North Dakota Democratic-NPL ended the day with a lengthy discussion on whether or not to keep the issue of legalizing all forms of marijuana on the party’s platform. Zac Echola, of the Democratic Socialists of America, and Dustin David Peyer, who declared himself a proud marijuana advocate, stood up to voice their dissent to the motion to remove the amendment. Many others also stood up to show their support for legalizing all forms of marijuana, and the motion to remove the amendment failed to pass.